I am sure we would all be in agreement that we do not take the time to read those credit card agreements we get in the mail. But truth be told, you should. It can be a little time consuming but there are important details about the terms and conditions of your card that you would want to know. 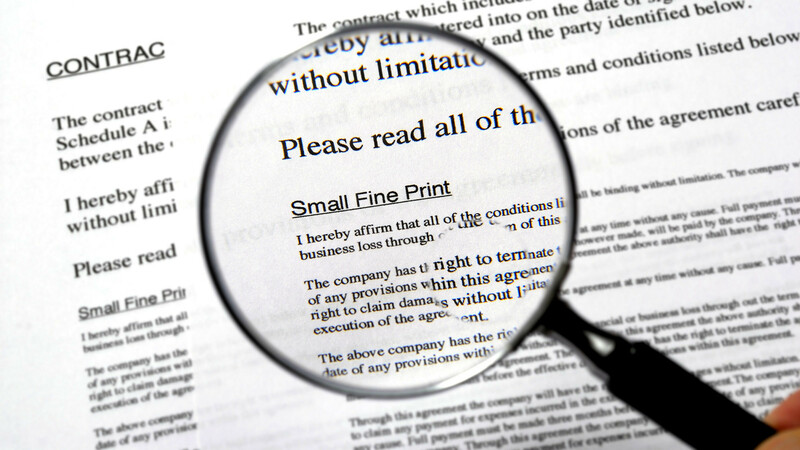 Below are 10 important details to pay attention to in the fine print of your credit cards. When applying for a credit card, one of the first things to look at is your credit limit. All credit cards advertise introductory offers using the terms "as much as" or "up to" with regards to the credit limit you may be approved for. Those terms are important to pay attention to since they do not guarantee you will get that credit limit approved for yourself. If you do not know your exact credit limit, you could end up going over it and being slammed with fees and a higher interest rate. Once you know your credit limit, find out what could change it. This could be anything from making a late payment, missing a payment or being assessed a fee. Find this out asap, especially prior to making any large purchases. The interest rate you are getting as an initial offer is always in big bold print. They do this as a marketing tactic to attract new cardholders. Although the number looks great, it will change and you need to know when and to what rate. Peruse the fine print for terms like variable rate, APR, or introductory interest rate. Also keep in mind that a single missed payment could cause you to lose that initial rate before the expiration date. If you use your credit card for a cash advance, you will most likely have two different interest rates in play. The former usually comes with a higher interest rate than what you have for purchases. And if you are past the introductory low interest period, you will have three different rates to think about. When it comes to making a payment, you will want to find out how it will be distributed for the different interest rates. In some instances, by default, the cards will allocate a smaller percentage to to go towards the higher interest rate charges. Double check your card's fine print and see if you are given the option to request a certain payment distribution for every payment you make. We have all been assessed those pesky extra fees on credit cards. Fees for late payments, missed payments, cash advances etc. Also check to see about any fees for going over your credit limit. It would be wise to go through the fine print to see what fees you may be charged, when you will be charged and how much. In addition, find out if there is a cap on the number of fees that can be charged and if the company can adjust those fees at any time. Some credit cards even have a set time of day as the cut off for a receipt of payment. This is not as common of a practice but some credit card companies buy unpaid debts. They will then offer credit cards to the debt-holders. If you've ever defaulted on a debt, read the fine print to make sure the credit card company is not asserting their right to include old or defaulted debts on any new credit card openings. When it comes to the details in the fine print, you have to keep in mind that those can change at any time. With that being said, you do need to be notified of any changes to the terms of your agreement. It is important that every time you receive your monthly statement, you review the terms agreement. You can always call the credit card company to try and negotiate different terms. If the terms are really poor, pay off the card and do not use it. This is a better choice than closing the card as it can put a dent in your credit score. With this clause, you are agreeing to not take the credit card company to court if there is a dispute. Some of the larger banks have done away with this clause while others opt you out within the first couple of months of initial usage of the card. Credit card companies can access lots of information about you. Everything from where you shop, how much you spend, the time of day you are shopping and more. Many credit card agreements have a clause that states that they can share your information with any third party. This means any business can start sending you their marketing materials. Check the fine print of your credit card to see how you can opt out of this practice and keep your information private. Credit card companies want to stay on top of the financial habits of its cardholders and they do this by periodically accessing your credit report. These types of inquiries can have a negative effect on your credit score and if it drops, they can now up your interest rate or lower your credit limit. Promotional offers of zero percent interest for a specified period of time can be appealing for many. Unfortunately, in some cases, if you still owe even a tiny amount of the original balance, you can be charged interest retroactively for the full amount. Furthermore, if you make additional purchase that does not fall under the "promotional" side, you can get confused as to which debt you are paying on.